What’s the Magic of Low-Carb Diets? Low-carb diets are powerful for weight loss, but even the people who all agree that they work can’t agree on precisely why they work. Is it only because eliminating a food group automatically forces you to eat fewer calories, so it bypasses all the ways that humans are terrible at calorie-counting and tricks you into eating a low-calorie diet without realizing it? Or is it actually via hormonal pathways that affect physiological drivers of fat storage? You might say it doesn’t matter – if it works, it works, and who cares why? But the answer does actually have consequences, and luckily, it’s been studied – quite a bit, actually. One way to test the question would be to put two groups on a diet with equal calorie content, but have one group eat low-carb and the other just restrict calories. If low-carb diets cause weight loss for some reason other than strict calorie restriction, then the subjects in the low-carb group should lose more weight despite eating the same number of calories. There was no difference between the average weight loss of all the people eating low-carb diets and all the people eating low-calorie diets at either time point. Basically the same thing was true in diabetics: people with diabetes had lower average weight loss across the board, which didn’t differ between low-carb and other diets when calories are held constant. This suggests that it’s really the calories, not the hormonal effects of a low-carb diet that matter. But hang on for a second and take a look at another review. The 2014 review above only included studies in which calories were roughly equal. A 2009 systematic review of randomized controlled trials that compared low-carbohydrate and low-calorie diets, without specifying that calories had to be equivalent (most of the low-carb diets didn’t actually specify calories at all, just carbs). The review looked at studies that lasted between 6 months and 1 year, and concluded that low-carbohydrate diets were overall more effective for weight, HDL, trigs, and systolic blood pressure, and that they were generally easier to stick to. So how did two reviews of the evidence come to opposite conclusions? Probably because they have only one study in common: otherwise, they compared completely different studies. The 2014 review excluded studies where the low-carb subjects got to eat as many calories as they wanted, which took out most of the studies in the 2009 review. In most of the studies from the 2009 paper, the subjects in the low-carb group ended up eating slightly fewer calories than the subjects in the other groups. So is it the Calories or the Hormones? Or Is That the Wrong Question? If calories are held constant, people on low-carb diets lose roughly as much as people on high-carb diets. If calories are not held constant, people on low-carb diets naturally eat fewer calories than people on calorie-restricted diets, and thus in the real world, they tend to lose more weight. So, it’s a closed case, right? Calories count; low-carb diets just make it easier to eat fewer calories and hormones don’t actually do anything? Not quite. Because that still doesn’t explain why people on a carb-restricted diet eat fewer calories even if they aren’t instructed to reduce them. They’re allowed to eat as much as they want, so presumably, if they eat less, it’s because they’re just not hungry and don’t want any more food. But what makes them less hungry on a lower amount of calories? Hormones! What allows them to burn the calories they eat for energy instead of storing them as fat? Hormones! The insulin-sensitizing effects of a low-carbohydrate diet, the overall hormonal regulation that comes along with it, and the improvement in appetite regulation when you’re not on and off the blood sugar rollercoaster all the time make it possible and even easy to eat fewer calories without calorie-counting. It’s not a question of calories or hormones. It’s a question of how hormones affect calorie intake and use. The amount of food that most people actually eat is driven by their hormonal signals, not by calories, even if they’re trying to calorie-count. The hormonal regulation on a low-carb diet is a very important reason why they work so well, because it lowers calorie intake and improves nutrient partitioning naturally. The success of low-carb diets is a perfect proof of the point that “calories count, but don’t count calories.” Consciously trying to manipulate your calorie intake by counting them just doesn’t work as well as eating a diet that regulates your hunger hormones (which are the real drivers of what most people eat, regardless of what calorie goals they have). Just as a side note, both reviews had some issues, most notably that a lot of the “low-carb” diets weren’t. A lot of these studies (for example, this one and this one) included up to 40% calories form carbs in the “low-carb” group – that’s certainly lower than a typical American diet and lower than the high-carb control group, but it’s nothing at all like “low-carb” by Paleo standards. 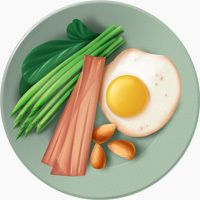 Just to give you some context, if you ate 3 eggs fried in butter with a big pile of wilted spinach for breakfast, a salad with beets, leftover pork roast, and vinaigrette for lunch, a handful of almonds for a snack, and then a baked sweet potato with 2 chicken drumsticks and some fried onions for dinner, your day would be roughly 27% protein, 56% fat, and 17% carbs. That’s a moderate-carb diet by Paleo standards, and it still has half the carbs of some of the “low-carb” study diets. It’s worth noting that even the 40% carb diets were more effective than the high-carb study diets for naturally reducing calorie intake, but still – if you’re trying to get an idea of the results you’ll get from eating low-carb Paleo, a 40% carb diet probably isn’t it. It’s not a question of whether low-carb diets work through lowering calorie intake or through regulating hormones. That’s really the same question: they lower calorie intake because of the way they regulate hormones. In the real world, low-carb, calorie-unrestricted diets work better for weight loss than low-fat, calorie-restricted diets, because they’re better-aligned with the way humans are actually designed to regulate our diet: by following our hunger hormones, not our nutrition tracker. Bear in mind that this indicates nothing about whether or not low-carb diets make you healthier: health and weight loss are two different things. It also doesn’t touch on people with specific medical conditions that might make weight loss harder or just different. 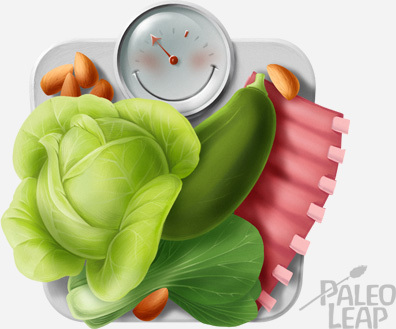 The health benefits of low-carb diets are a different question, but for weight loss specifically, you can’t separate the hormonal advantages from the calorie restriction. In the real world, eating a moderate to low-carb diet is better for weight loss than low-fat calorie restriction. You don’t have to be extreme about it. Remember that the study diets showed results at up to 40% of calories from carbs. If you’re eating a low-carb diet, eat to hunger, but don’t go nuts adding fat to things for the sake of adding fat to things.